After attending our first State Leadership Conference, alongside approximately 1,500 participants, three of our HOSA student competitors have qualified to compete at the HOSA International Leadership Conference June 27- 30 in Dallas, Texas. They are: Kelsie Chasteen, Káya Davis and Kierstyn Kuhn. Each qualified for the Healthcare Issues Exam. 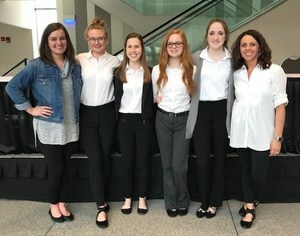 In total, four Edgewood students (including Kyra Wells) participated at the conference and each of these young women worked exceptionally hard. Congratulation to each of you and Thank You for representing Edgewood with such poise, professionalism and Cougar Pride!